I'm a big fan of agile methodologies, Scrum in particular, but this post isn't about how to implement Scrum. There are already plenty of resources available for that. I would recommend reading books by Ken Schwaber ( like Agile Project Management with Scrum) but if at all possible, I'd suggest taking a training class. Nothing beats being able to ask questions to a Scrum coach/trainer and spend a couple of days practicing the techniques with peers. So what is this post about? As the title suggest, about the backlog. There are tools out there that let you do agile project management but some times the easiest thing is just to use a spreadsheet. I haven't seen too many examples of those, so I figured that would be an area I could help out in and walk you though a spreadsheet that has evolved over time for me and actually started from a sample that I got from my ScrumMaster certification class. The first worksheet is the product backlog spreadsheet. I'm going assume you already know what a product back is and just walk through the major columns of this worksheet. Item ID - This is important since this ID is also used in the Sprint Backlog to track how a product backlog item is exploded out to a various number of tasks. Requirement ID - This is used to track th backlog item to a requirements document. External Dependency ID - This one lets you know what, if any, the backlog item is dependent on some external entity on (for example, you need the design firm to provide you the HTML/CSS/etc to be able to complete the item). The last two columns are a little bit unique in that they allow you to better track milestones and external dependencies. Milestones are a guage used by the business to get a high level feel for whether or not the project is on task. Milestones are typically something you come to a concensus on with the at the very least the product owner. Here's a view of the Milestones worksheet which provides more details of each milestone. The external dependency ID columns as I mentioned earlier just lets you track what, if anything, that backlog item depends on some external source in order to be completed and sometimes even started. Here's a view of the external dependencies worksheet. This is a great way for you to make it visible to the business what drivers you do not have control of that may put your delivery at risk. The resource allocation spreadsheet is really used as a driver for the sprint backlog worksheet. It allows you to enter the number of ideal hours each team member has to provide to the project throughout the sprint. The next worksheet is arguably the most important one, the sprint backlog. The one I use is setup for a three week sprint and gets the value for the available hrs and the start date directly from the Resource Allocation worksheets, making it easy to change the dates and see how many stories you can work on as you fillout the worksheet. The only other thing that is of interest is that my convention is to use the original Item ID from the Product Backlog and just append .001, .002, incrementally. This is a simple way to see how many smaller tasks were needed to complete the Product Backlog item but I'll leave it up to you to decide if this is a good model and expand upon if needed. 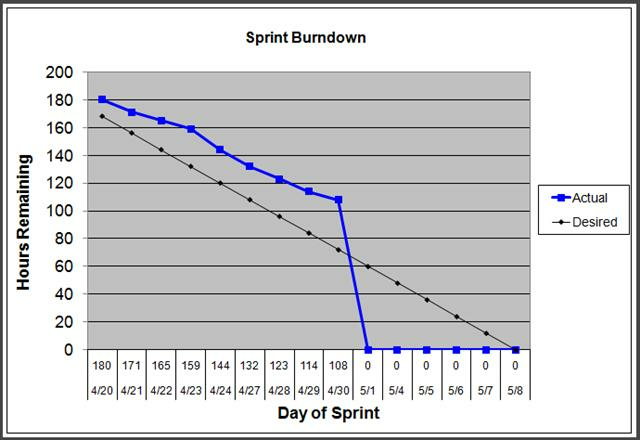 Of course all the data in the Sprint Backlog is easily summarized in the Burndown chart. Well, that's all for now, but I hope the spreadsheet is of some help to someone.